The residents of Battersea and Brixton have some of London’s most talked-about restaurants on their doorstep. From the mismatched chandeliers – not to mention the homemade cod and salmon fishcake with dill sauce – served up at Fish In A Tie on Falcon Road in Battersea and nearby Mien Tay’s fresh approach to Vietnamese cooking to Brixton’s cosy Eritrean restaurant Asmara, it’s no wonder London is a centre for world cuisine. In fact, a taste for food and drink from around the globe is now recognised as an integral part of the London lifestyle. This vital ingredient of a Londoner’s lifestyle is now being taken to a new level by the emergence of food and drink festivals. We’ve previously highlighted the first Brixton Food Festival, which is being held on the weekend of 10 and 11 September. 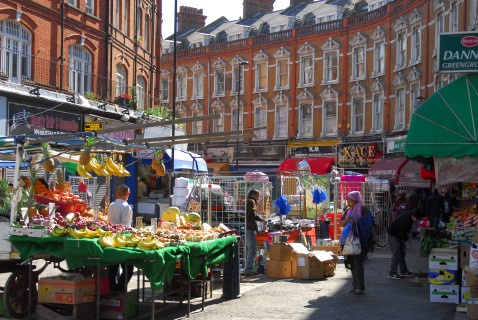 This event will see Brixton’s restaurants, markets and food traders invite the whole of London to discover what makes Brixton so special, or remind them why they all fell in love with this part of the capital in the first place. The food and drink festival season is, however, already underway. The Great British Beer Festival at Kensington Olympia is running until last orders are called at 6.30pm on Saturday 13 August. Run by the Campaign for Real Ale, this annual event is now in its 38th year and attracts over 50,000 visitors. The 2016 festival will feature over 900 real ales from microbreweries and beloved British brands, including Battersea-based Sambrook’s brewery. Visitors can also expect hundreds of bottled and foreign beers, as well as ranges of real ciders and berries. The entertainment also includes Hat Day on Thursday 11 August, pub games, quizzes and live bands. Advance tickets, which cost from £11 for non-CAMRA members, are available here. Why not work up an appetite at one of two food festivals taking place over the August Bank Holiday weekend? The BBC Good Food Festival takes place from 26-29 August. Held in the grounds of Hampton Court Palace, foodies can pick up expert tips from the summer kitchen where celebrity chefs such as Bake Off’s Paul Hollywood and Michel Roux Jr will be found. A great family day out, children can drop in for juggling classes at the circus skills school, have their faces painted, enjoy messy play and old school games including the sack race and egg & spoon races. Alternatively, the Foodies Festival takes place at Alexandra Palace from 27-29 August. Featuring Michelin-stared chefs creating their signature dishes, a Cake & Bake Theatre, craft beer masterclasses, an artisan producers’ market and live music, this family-friendly event is billed as the UK’s biggest celebration of food and drink. Other attractions include the all-new Chocolate, Cake, Bake & Preserve Theatre, while youngsters can learn a few gastronomic tips at the Children’s Cookery School. The Chilli Eating Competition is another hot ticket, alongside the chilli food market that will have all manner of chilli-related products on sale. Moving to Battersea or Brixton is as much a lifestyle choice as a wise financial investment. For help identifying a property that matches your lifestyle, contact Eden Harper today.